Please enter a short message for the box label. 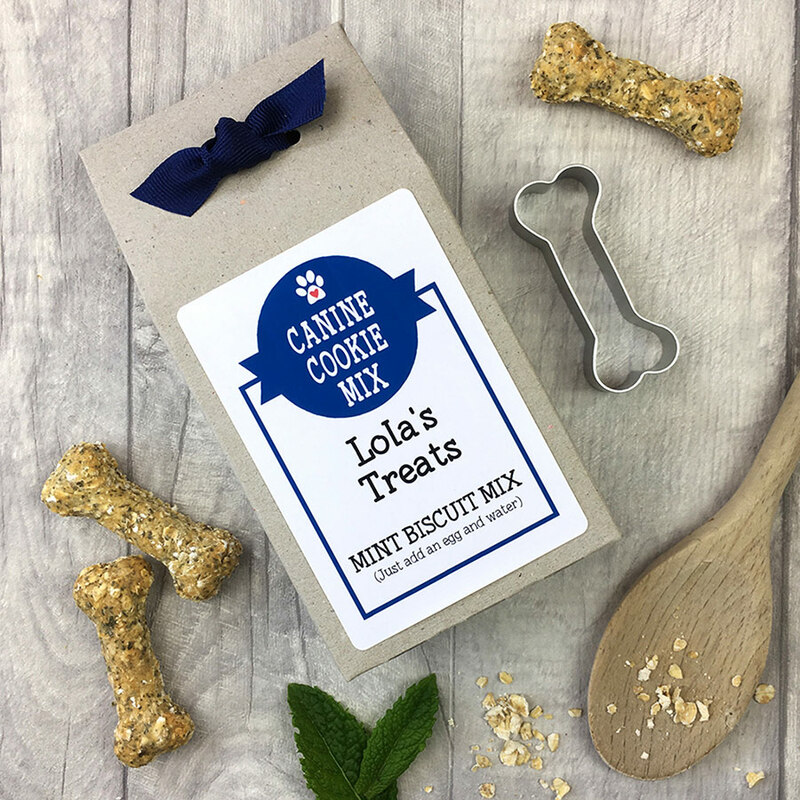 Why not treat your pet with this personalised “bake your own” canine cookie kit in a lovely box complete with a bone shaped cookie cutter? This all-natural dog biscuit baking mix is the perfect way to show your dog how much they are loved or as a gift for your dog’s friends. The oat and mint biscuit mix, which is made from only natural ingredients, just requires the addition of 1 egg and a little water to make approximately 18 dog biscuits. The mix is packed with oats and mint. Oats are rich in antioxidents and soluble fibre and dried mint is traditionally soothing for digestive poblems and used to freshen breath but is also said to reduce gas, help with nausea and motion sickness. Included in the box is a bone shaped cutter which is perfect for cutting out your dog treats. Add your dog’s name or a short message to the box label. Made from high quality human grade ingredients. Feeding Guide: Not recommended for dogs under 6 months. These dog biscuits are treats and are to not to replace a balanced diet. Ensure fresh drinking water is always available for your pet. You may wish to cut the biscuits into smaller pieces to suit your dog. Box dimensions: H 16cm x W 8cm x D 4.5cm.